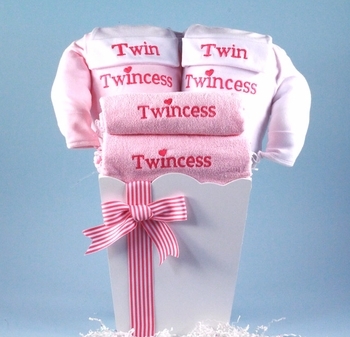 This cute twin girls gift features cotton baby gowns with matching hats and bibs embroidered with "Twincess" or "Twin" on each! All items are of the highest quality and made in the USA! See More Images above for a close-up of the fine embroidery shown on a bib.